I am re-posting this with some additional and updated information. I am now including quotes from the Premier League handbook to explain in detail what a shareholding of 30% means. Alisher Usmanov (through Red & White holdings) is very close to owning 30% of Arsenal Holdings shares. By the time you read this he may even have got there. Does it matter? Here’s a bullet point summary. How many shares has Alisher Usmanov got now? Firstly, there are 62,217 Arsenal shares, so 30% is 18,666. It is difficult to give an exact ownership figure in a moving market because there is no obligation for a purchaser of shares to announce every time he buys one. Announcements have to be made at certain thresholds; the last one for Usmanov was when he reached 29% in June 2011. It’s possible to track trades on the Plus Markets website. However, this is ALL trades, and we don’t know for sure who else is buying. What we do know from this announcement is the exact number Red & White had on 27 May 2011 – 17,424. At this point they passed 28%. Tracking the number of trades listed on Plus Markets since, allows us to calculate that Red & White still need at least 195 shares to get to 30% (taking into account the fact I know they’re not the only purchaser in this period). However, I have now discovered that Arsenal.com helpfully provides some information here, which shows that as at February 17, 2012, Usmanov had exactly 18,437 shares, leaving him 229 short of 30%. This also means that it appears someone else has been buying in the last few months, as I can’t otherwise account for the difference in what R&W now have and the total number of trades since last May. The Daily Mail did report recently that there was a ‘mystery investor’ buying shares, but the identity and reasons for this are unclear. Why does Alisher Usmanov want 30% of Arsenal shares? The handbook is 475 pages, and I haven’t read them all. I’m sure Mr Usmanov’s lawyers have. As we know, Mr Usmanov is not a Director – yet – but, the PL define the title to include “a person having control over the club”. So what do they mean by control? So in paragraph 1.8.2, we see that the PL regard someone with 30% or more of the voting shares of a club as in control. So if you have 30% you are deemed to be in control, and if you are in control then you are deemed to be acting as a Director, even if you’re not actually on the Board. To recap, then: Usmanov gets to 30%; 30% is treated by the PL as a de facto Director; Directors have a duty to sign off that reports to the PL are correct; reports include most transactions of £25,000 and over. So how is a fellow supposed to sign off if he doesn’t have full access to the books? This I imagine is the argument that Usmanov will be using. If he is allowed access, he will get all the details of who is paid what, where all the income comes from and where the expenditure goes. This knowledge will allow him to judge whether the business is being run well much better than by reading the published accounts that are available to anyone. There is a wealth of detail that can be hidden in ‘overall wages’ and ‘miscellaneous expenses’. Why did the Premier League put these rules in place? It was not to help minor shareholders like Mr Usmanov; they are there so that if ownership of a club was split between several parties, those with relatively big holdings could not duck out of the responsibilities of ownership, they would be forced to take an interest. What the PL didn’t envisage was the situation at Arsenal, where there is a majority shareholder (over 50%) plus another shareholder at 30% who is not welcome on the Board. Stan Kroenke may or may not care whether Usmanov reaches 30%; he doesn’t care enough to buy up remaining small shareholdings in order to stop Usmanov getting them. However, Kroenke still may resist opening the books on the basis that the rule was implemented to stop people avoiding liability, and Mr Kroenke is very happy to take full liability at Arsenal, thank you very much. What else does a 30% shareholding mean? Short answer: nothing – anymore. Not at Arsenal, anyway. When there are a bunch of small shareholders and no single person has majority control, 30% is the magic figure at which a shareholder has to make a bid for all other shares in a company. Again this is designed to stop shareholders avoiding responsibility. It stops them building a big stake in a company without taking on any of the duties of ownership. You will recall that Kroenke bought enough shares to take him to just below the 30% threshold, then stuck on that level until it suited him and the rest of the Board to make his move. At that point he agreed a price with Danny Fiszman and the other Board members, and was obliged to make an offer for all the other shares. But now that that there is a majority shareholder, there is no rule that says Usmanov getting to 30% obliges him to do anything. He does not have to make an offer to Kroenke if and when he reaches 30%, and this is not his reason for wanting to get there. Some people mistakenly think that 30% entitles Usmanov to a seat on the Board. It doesn’t. The Board is voted for by the shareholders and votes require a majority, 50% plus one share. As Kroenke has about 67% his vote wins. Usmanov is not joining the Board. So 30% confers no other privileges. What percentage shareholdings are important? The most important is 50%, because most votes in limited companies in the UK require a simple majority. As stated, Kroenke owns about 67%, so no one can outvote him on anything to do with the day to day running of the club. He can appoint the Board, sack people and interfere in Arsène’s team talks if he likes. When the other shares are split into smaller blocks and you have a few mates on the Board with you, it is possible to maintain day to day control of a company with a stake of around 30% – as Danny Fiszman was doing – but you need 50% to be absolutely sure you don’t need to answer to the riff raff. 75% is also important, as you need support from holders of 75% of shares to make some changes to the company constitution. This is why Usmanov’s initial push was to get to 25% before Kroenke launched his full bid. Although Usmanov knew he could not easily get a majority (with Kroenke already cosied up to Danny Fiszman), with 25% he could block anyone restructuring the company and trying to keep him out for good. The last important number is 90%. If a single shareholder reaches 90% then he can, if he desires, force the remaining shareholders to sell up and then take the company private. Kroenke had no chance of reaching 90% as long as Usmanov opposed his takeover, so the remaining small shareholders can be grateful to Usmanov for that. We may never know whether Kroenke would have taken Arsenal private, but as supporter feelings do not appear to be high on his list of priorities it’s a possibility. It appears that he views supporters as a necessary evil and small shareholders as an unnecessary irritant. I would love to be proved wrong. If Kroenke does decide to sell to Usmanov at some point, Usmanov will immediately have over 90%. We’ll then find out his real attitude to supporters and small shareholders very quickly. Does it matter if the club is taken private? Depends on your outlook. If you have no interest in how your football club is run and think that is for other people to deal with (even though it affects every aspect of what happens on the pitch), then no, it doesn’t matter. But public companies have to publish accounts and have a certain level of openness, which I prefer to believe is important when the company is a football club that people invest in emotionally as well as financially. Ask yourself this: Do you prefer to have a club where supporters can scrutinise to a large extent how it is run, or do you prefer everything behind closed doors and the Board not answerable to anyone but themselves? When can Usmanov make an offer? Anytime he wants to. Tomorrow, next year, never. So why doesn’t he make Kroenke an offer now? Maybe he has, behind the scenes, but so far there is no indication that Kroenke wants to sell. When he made a counter offer right after Kroenke had made his, Usmanov specifically said he would buy anyone’s shares except Kroenke’s; that was to stop Kroenke immediately making a quick few million by buying shares from others at one price and then selling straight on to Usmanov. Usmanov now gives the impression that he would quite happily buy all Kroenke’s shares, but probably not for the same amount he is paying for the few odd shares he is still picking up from small shareholders. The scarcity of shares in the market and Usmanov’s determination to reach 30% means that the price he’s paying has pushed up from under £14k to £16k a share. If you took this as a true reflection of value and extrapolated it to apply to all Arsenal shares, then the club is suddenly worth over £1bn, compared to the £760m that Kroenke’s offer valued it at. Clearly this is a hypothetical figure, at a time when the on-field performance is flagging. An unfortunate consequence of Usmanov’s push for 30% is the shortage of shares for the Arsenal Fanshare scheme, in which supporters club together to buy shares and maintain an independent stake in the club for the benefit of all. What is Kroenke likely to do? Kroenke boasts that he has never sold a share in any of his sports ‘franchises’. He hints at least that he is at Arsenal for the long term. He may get fed up with the scrutiny from fans (particularly those who have both information and the ear of the media, such as the AST) and also from Usmanov, should he be allowed the access to information that he seeks. This could conceivably cause Kroenke to sell up. The price and therefore the amount of profit he walks away with would depend as much on how desperate he is to sell and how desperate a buyer is to take full control as it would on the situation of the club at that time. Realistically Usmanov is the only likely buyer, because any third party would be faced with the same problem Kroenke has: Usmanov in the wings. However, it is rumoured that a small number of Arsenal shares have been bought by a mystery investor very recently. This could be an attempt to stop Usmanov finding the shares he needs in order to reach 30%; it could even be Kroenke or an associate. Because there’s no obligation for Usmanov to report his shareholding until he reaches 30%, we may not find out the full details for a while yet. Meanwhile the apparent stagnation in the boardroom does not appear to be helping the manager or the team. The other subject I haven’t mentioned above is the Premier League’s ‘fit and proper persons test’, or ‘Owners’ and Directors’ Test’ to give it the proper title. Mr Usmanov will be subject to this as and when he reaches a 30% shareholding. As far as I am aware there is no suggestion that Mr Usmanov should be disqualified from acting as a director of any company in the UK or be disallowed for any of the other reasons the Premier League lists, so equally I am not aware of any reason why he would not pass this test. The Arsenal Supporters’ Trust will be issuing an expert analysis of Arsenal’s current financial position on Monday February 20, ahead of Arsenal’s six-monthly accounts. Are you definitely sure that there isn’t, somehwere in the 475 pages, an exception that means that 30% is not “control” if someone else has a majority? It would make perfect sense (and be in line with the Takeover Code rules on 30% offer triggers too I think).. It would make quite a difference to the very helpful analysis above. I’ve combed it as far as I can! Feel free to continue the research, I’m sure Mr Usmanov would be grateful! The 30% threshold is deemed to be control unless it can be demonstrated that control lies elsewhere. In this case it would be clearly demonstrable that R&W becoming a 30% shareholder would have no influence on the Board of Directors as there is a majority shareholder, who has previously made an offer to all other shareholders. Unless R&W get to over 50% they have no rights other than those of all minority shareholders. @JoeOS, can you tell us where it states this in the Premier League handbook. It is what is stated in 1.8 above. Getting to over 30% but less than 50% will result in any ability to influence the Board or KSE. Phil, do you know who else is buying shares at such high prices? And why? Seeing as Kroenke and Usmanov have ~96% of the club’s shares between them it seems a bit stupid paying well over the odds for something if no use. Andy, the Fanshare scheme set up by the AST has bought some since R&W got to 29%. I can’t be 100% sure whether anyone else has. JoeOS has it right. The 30% is only significant if, as set out 1.8 and 1.8.1, control isn’t already exercised by someone. 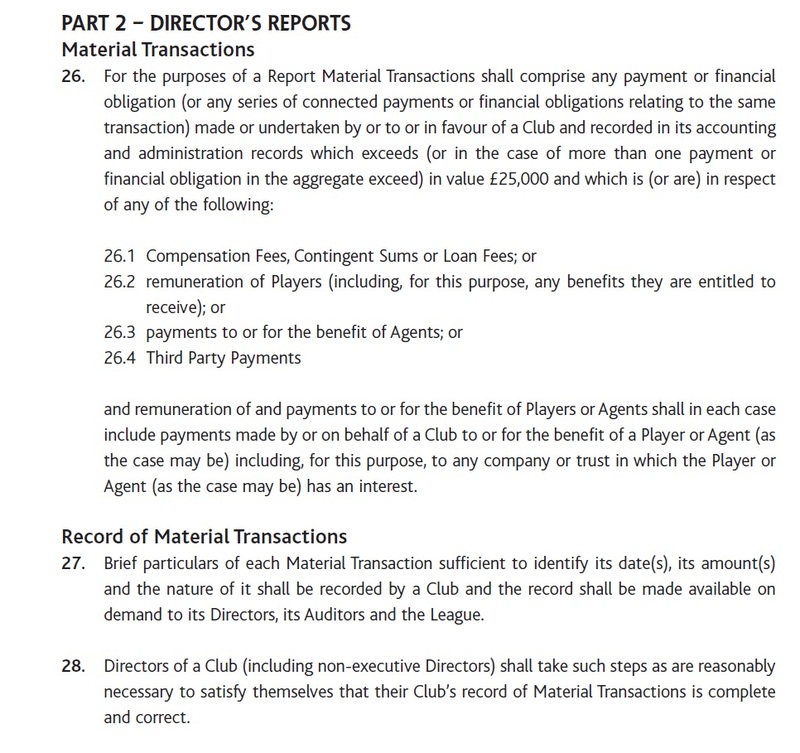 No, at the end of section 1.8.1 there is an and/or – so you have power over the Board (as Kroenke has) and/or you have 30% (which Usmanov probably will at some point). Then you are ‘in control’ and must sign off reporting. What is to stop Usmanov joining the fanshare scheme? Nothing, but there are limits on the investment amounts that would prevent him getting any benefit. The 30% control ruling by the PL is aimed at people like Abramovich who is not a director of Chelsea. Someone owning 30% but someone else owning more than 50% does not mean the 30% holder is in control. The PL will have to review its rules. I hope Usmanov takes over. A little revolution is good every now and then. The current state of affairs is that we are a sustainable? business model, yet we under-perform on the pitch. Viva la revolution! A 30% shareholding when there are many smaller shareholders, in most circumstances would give effective control. A 30% shareholding where there is a majority shareholder gives no control where there is no power to appoint a director or participate in any way in the management of a company or influence the Board. If I were advising “R&W” I would recommend that they continue to buy up shares as they become available to send a message that they do not intend to go away and to orchestrate an agitprop campaign in the media and via the intenet with the objective of destabilising the club to enable control to be acquired in the fullness of time. Remind me again why we hate Usmanov? Like, actual reasons, which have nothing with him being fat. He has been convicted, his criminal records are there for all to see. I’m not the judge and jury – But if you look at the conviction you have to look at the pardon? Also his statements regarding Arsenal are public and he is willing to put hs money where his mouth is. Which is more than can be said for silent Stan. Nether of them is likely to go away anytime soon and our recent history shows that trouble in the boardroom has left a detrimental power vacume at the club IMO. The sooner a deal is done the better! The way you put it, it was libellous, trust me. Pardons are unrelated to determinations of guilt. They are granted for political reasons or because of personal connections, whether in Uzbekistan or the United States. So, when wondering about the character of a particular individual, say, after a conviction for corrupt practices, his subsequent pardon by a politically powerful crony who has been called a gangster himself is not helpful in bolstering his character. Excellent and informative article mate, I wish more Arsenal blogs provided this kind of detail. The directorship is defined as one having Control, which is “deemed” to include the power to exercise at least 30% of the voting rights. That is to say, the presumption that a shareholder is a Director attaches to 30% ownership. What the regulations do not say directly in § 1.8 (excerpted) is whether that deeming control is a rebuttable or conclusive presumption. Importantly, 1.8 does say that Control is determined with “regard to considerations of fact or law involved, and, without prejudice to” the general definition that one has Control when he can “exercise power” over the policies, affairs, and management of the club. In a situation like we have at Arsenal, a 30% holding clearly will lack any actual influence at the club because the Majority Owner will legally be able to dictate all of the decisions of the club and appointments to its Board. Therefore, it is a rebuttable presumption only that at 30% owner has Control and thereby is a Director. In this case, it is easily rebutted, and so JoeOS is correct. This is common sense when you consider the purpose of the rules, which are to define a Director’s obligations and liabilities. One obviously should not be held liable for acts he has no power over (such as being forced to sign off on accounts he has no actual or legal ability to manage). Can I please get an editor? Everyone, look away! Not sure what you’re saying, mate. I can unapprove all your comments if that’s what you want. Haha! I was only making light of some typos in my post. Oh, I see. Well I’ve just tidied it for you in that case. I will be soon, hopefully. It seems JoeOS might actually be a practitioner with some experience. And like he said, RWH will have had their attorney’s pour over the rules in full. What we have here is just a snip, although certainly a crucial one. And thanks for the edits! Thanks for the post and the detail. I think the solution to all this balls ache can be resolved with the appointment of David Dean. He knows both parties well. He is perhaps the only person who can influence the manager. His son is the agent of our best player/s. The word on the floor is a PE fund is purchasing shares with the obvious in mind. This may be simplistic but for every £ these guys have spent lining the pockets of the so called custodians of our club. Means that there was one less pound that could have been put in the tfr kitty. I translate into Korean at my blog http://terraflux.egloos.com/3809619 and some Korean community. Please tell me If you mind. I’ll delete right away! No problem, as long as you put a link back to this site. I don’t see the relationship between share value and funds available for transfers. If someone decides to buy £80m worth of shares the money is transferred into the account of the selling shareholder, not the club. If someone decides to buy £80m worth of shares the money is transferred into the account of the selling shareholder, not the club. There is no direct corollation between the amount an “investor” Pays to aquire shares and the funds they make available to the club, if they gain control. But I feel there is a relationship as seen with Chelski – Liverpool – Chitteh – Manure. @Arsenalist, no reason at all he’s a lovely chap, not dodgy at all…..
oh there might be this from Craig Murray, former United Kingdom Ambassador to Uzbekistan….